Cleveland Press, March 4, 1908. 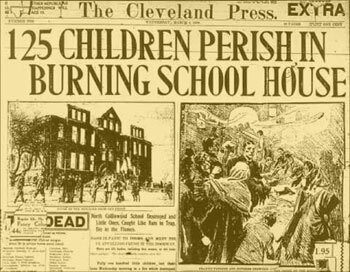 On this page, a photograph shot from a distance portrays ruins and the effort to fight the fire, but a roughly drawn sketch of smoke, flames, and desperate parents intensifies a feeling of action at the scene. 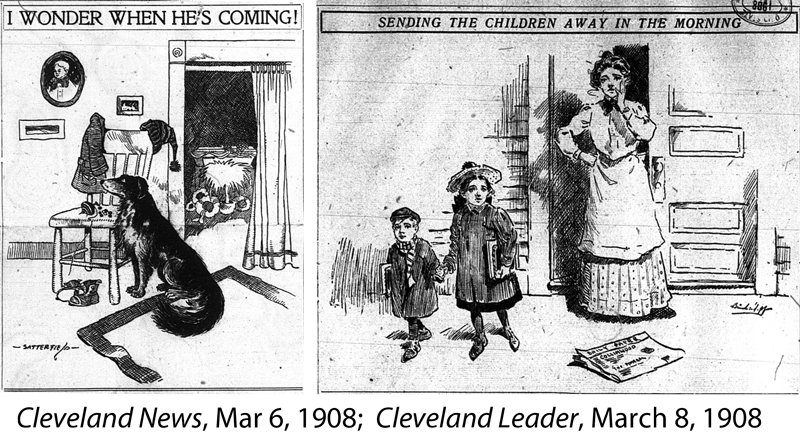 Cleveland News March 6, 1908. 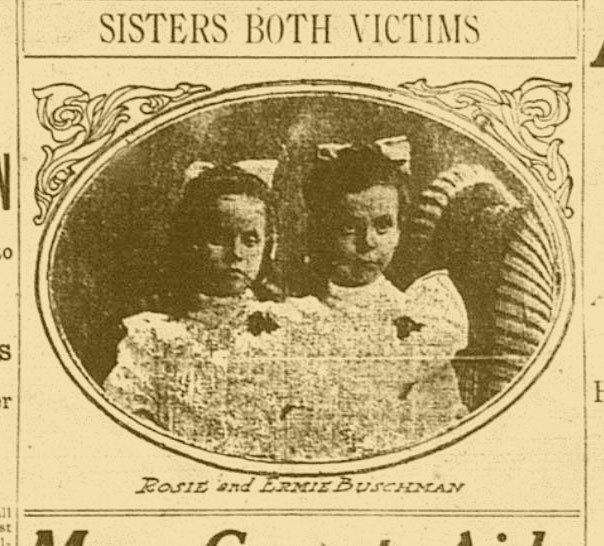 The framing around this portrait of the Buschman sisters suggests a mourning locket to be worn by surviving loved ones. reproduction in weekly and monthly publications existed, but the dailies relied on sketch artists I don’t believe so many pictures will be required for any great portion of the next century. As other editors left Dana’s blindered vision behind and turned more and more to photographs, their large and well-established graphics departments resisted. Photography threatened both the employment of illustrators and their status as drawers of journalistic truth. 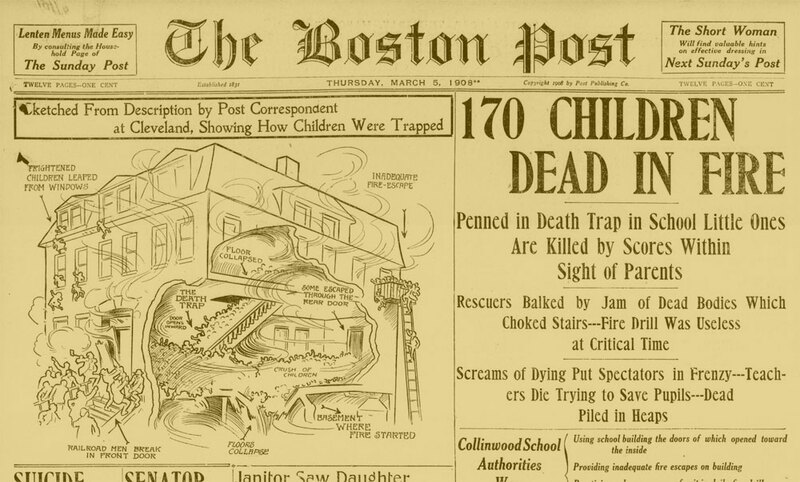 Readers, they claimed, This sketch misrepresents a number of facts, but the view into the building’s interior, cartoon-like men at the door, children leaping, swirling lines of smoke, and packed stairway heighten action more than any surviving photograph. wanted the art of hand-drawn lines and emotion—not mechanical images infinitely reproduced. 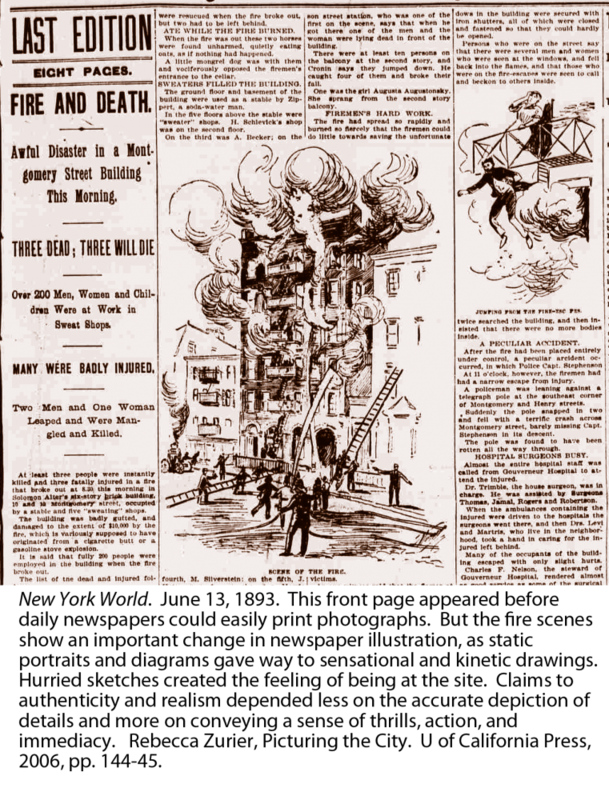 Newspaper artists failed, of course, to stop the onrushing force of the photograph, but in the coverage of the Collinwood fire, drawn illustrations lingered alongside and even within pictures shot by cameras. Photographs of ruins, street scenes, and bodies dominated visuals of the fire, but vivid diagrams explaining the tragedy also appeared. Editorial cartoons flourished. Artists drew elaborate frames around photographs of the dead; they enhanced photos with line drawings and sketched scenes from imagination that cameras couldn’t shoot. Newspaper illustrators had lost substantial ground to the camera by 1908, but, during this transition in the visual style of the papers, editors and artists still reached for effects that eluded photographers. Cleveland Press, Mar 7, 1908. A hearse carrying children for burial passes from the sketched foreground to the gritty grayness of the photographic world. Passage of the children’s bodies leaves ghostly abstractions of grief behind it.